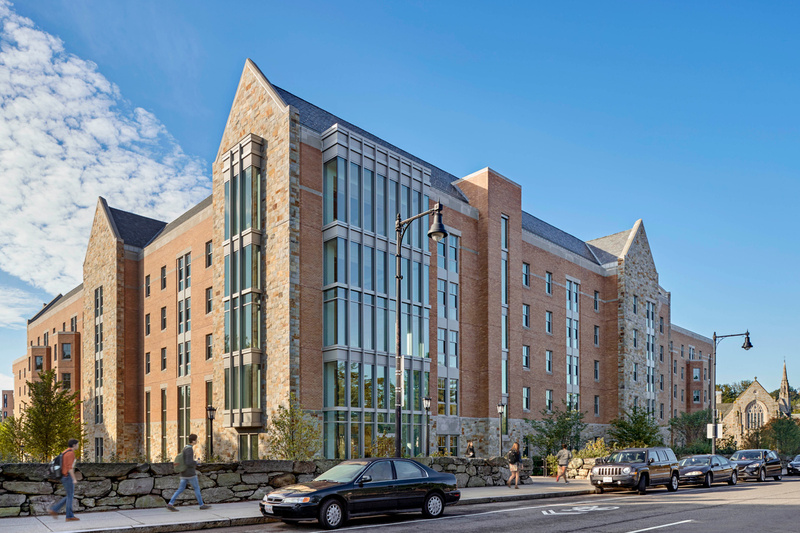 (Boston, MA) – BOND, the Northeast’s premier building, civil, utility and energy construction firm announced the completion of Boston College’s Thomas More Apartments residence hall. The new 245,000 square-foot building is located at 2150 Commonwealth Avenue. The three-wing building accommodates 490 students with a mix of apartment-style suites. It features a southwest-facing, multi-tiered courtyard with ample outdoor and recreational space. BOND worked closely with design firm, EYP and college stakeholders to deliver a building that combines sustainability and 21st century design. Awarded LEED Silver certification, the building incorporates eco-friendly design elements such as extensive daylighting, waste-water management and recycled building materials. It features a 90-person function room, study lounges, social areas, prayer room and three music practice rooms. It’s also the home of University Health Services. During the two-year construction project, BOND utilized Lean construction methodologies to minimize waste and maximize efficiency. BOND’s expertise using Pull Planning and small batch work execution saved four weeks in the construction schedule. This was critical to maintaining an aggressive timeline, completing the project in time for the academic school year. In addition, BOND’s in-house laser scanning services resulted in cost control for the college and informed the 3D model and logistics plan of the building’s tight, urban location. The Thomas More Apartments residence hall was completed on time and under budget, with a superior safety record. It formally opened its doors to BC students in August 2016.